My grocery store has chuck roasts on sale reguarly and it’s usually buy one get one free…which is great for this recipe. I always struggle with what to make with chuck roast, but now this is my go-to-recipe! It’s delicious, my mouth is practically watering now just typing up this recipe and staring at the picture below. 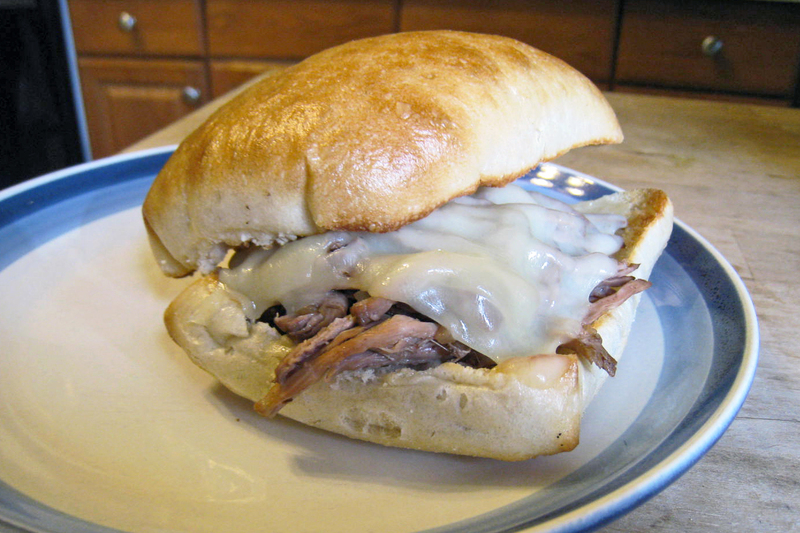 Swiss, provolone, or mozzarella cheese, shredded or sliced. Heat oil in a large pot over medium-high heat and rub roast with salt and pepper. When the oil is hot, carefully place the beef in the pan and sear it on all sides to lock in all the juices. Once all the sides have been sear, place the beef in a slow cooker. Sprinkle it with the onion soup mix. Pour the water and beef broth over the meat. Cook on low for 8 to 10 hours. The longer it cooks, the tender it will be. Trust me, cook it as long as possible! Once the meat is cooked through, shred the entire roast with a fork. Serve on crusty rolls, we really liked it on ciabatta rolls. Top it with a slice of your preferred cheese and broil it open faced in the oven for a few minutes to toast the bread and melt the cheese. Delicious! I halved this recipe and it worked out fine.